Thinking of putting new shocks and possibly springs on a 2001 S80 ... any suggestions on manufacturers and/or shock and spring combos? Any estimates on labor times for four shocks and for four shocks and springs? I'd guess 1 to 1.5 hour per strut and 1 hour per rear shock. Curious why you are thinking of replacing the springs. Unless they are broken (common to S40s but not the other models), springs should be good for a very long time. I found sticking with OEM struts (Boge Sachs) is best and then focus on replacing the key strut components that are failure prone such as the spring seats and end links. Anything rubber is best to stick to Genuine volvo or OEM (you can research the vendors on sites like FCPEuro, IPD or EEuroparts. As with any suspension job, you will need to wrap up with a four point alignment. All totaled, I'd guess your looking at $1200 - 500 in labor, 600 in parts and 100 for the alignment without adding springs. If you want to include springs, then budget another $75-80 per corner, moving the quote to $1500. Try FCP's complete strut assembly from Sachs. Save on labor big time. Curious why you are thinking of replacing the springs. didn’t know if there is a shock/spring combo that was good... I’m used to having cars w/ more after market tunability ...I guess. pretty sure i’ll just stick with OEM. Thanks for the detailed response ! 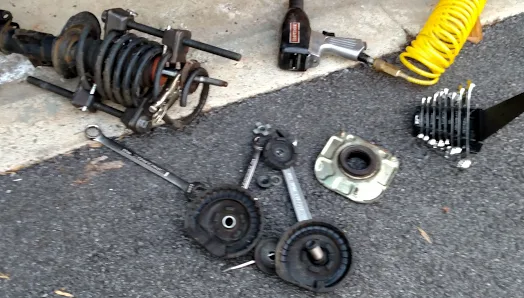 to note, if you plan on doing the work yourself, the prepackaged complete strut assemblies makes sense if you don't have the tools or skills (I have air tools and spring compressors so I've done struts on a number of different cars). If you are looking to have a trusty indy mechanic do the job, then you can shop mail order to get OEM quality and still save some$$. so I’ll do my parts investigation and go to a good Indy Volvo shop locally for professional labor . i just got the car so I’m getting acquainted ... no absolute need but the driver side rear squeaks/rattles alittle. Volvo S60 with Heico springs, and stock shocks. Should upgrade shocks? New Rear Shocks. Rear end now too high? 240. New rear shocks and coil springs.